WASHINGTON — Are you ready for spring? I can hardly wait for two weeks from today when winter is officially over with the arrival of the Vernal Equinox (spring). 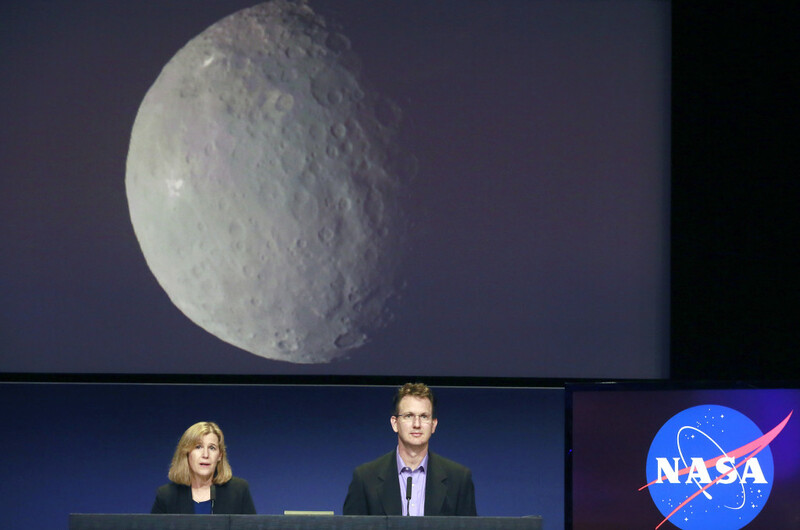 But our winter weather woes have not stopped history from being made on March 6 at the dwarf planet Ceres. For the first time we have orbited a dwarf planet. NASA’s Dawn spacecraft entered into orbit around Ceres at 7:39 a.m. EST today when it was captured by the dwarf planet’s gravity at a distance of 38,000 miles. Mission controllers at NASA’s Jet Propulsion Laboratory in Pasadena, California received a historic signal from the spacecraft at 8:36 a.m. EST indicating that Dawn was healthy and thrusting with its ion engine. This was the the indicator to mission controlelrs that Dawn had entered orbit as planned. Dawn and Ceres are over 300 million miles from Earth and the spacecraft’s radio signal takes almost 28-minutes traveling at the speed of light to reach Earth. The Dawn spacecraft also set another historical milestone today by being the first spacecraft to orbit two separate worlds. In 2011 Dawn entered orbit around the large asteroid Vesta to begin a one year mission of exploration before firing its advanced ion propulsion engine to set off for Ceres in 2012. The pictures and data obtained by Dawn revealed Vesta to be a stunning world with complex features and amazing sights. This year will be a banner year for exploring the smaller worlds of the solar system. NASA’s New Horizons spacecraft is enroute to a July 2015 flyby of demoted (dwarf) planet Pluto. The European Space Agency’s (ESA) Rosetta spacecraft is in orbit around Comet 67P/Churyumov-Gerasimenko returning stunning pictures that will only get better as the comet heats up as it nears the Sun. Additionally, Japan’s Aerospace Exploration Agency’s (JAXA) ion engine powered Hayabusa 2 spacecraft is flying to asteroid 1999 JU3 for a 2018 landing followed by returning a sample to Earth in 2020-21. Follow my daily blog to keep up with the latest news in astronomy and space exploration. You can email me at skyguyinva@gmail.com.